Well, maybe not that fast. But once you have slashed the weight of your multi-day gear, you can carry less for day trips as well. With both Washington’s Cascades and Olympics in day trip range, I have many wilderness outings available. But it is wilderness and in a day you can get just as far away from trail head as you might on a short backpack. The 10 Essentials still apply. Last summer one of the authors of a new epub “Guide to 100 peaks at Mount Rainer National Park (not including the big one)” introduced me the wonderful world of all the other places in the park. While some of these 100 peaks are well known favorites, many don’t get visited often. The guide takes you to parts of the park that lie in between the popular entrances. Some of the peaks are hikes. A few are technical climbs, but most are what get called “alpine scrambles”, like Barrier Peak shown in the photo. The route may be a boot track or simply cross country. Early season, there may be snow, and sometimes rock scrambling happens. A 3,000 ft. elevation gain is typical, so lightweight gear is good. I have gotten seriously hooked on these peaks. Barrier was number 41 for me. My backpacking gear is organized with two small sil-nylon stuff sacks, a red one for 1st aid gear and a yellow one containing repair and emergency items, including a backup light and batteries. Together these mini sacks weigh just over 1-3/4 lbs. and will address a wide variety of problems. I simply put them in my day pack for shorter outings. Other basic “just-in-case” or navigation gear includes my compass and whistle, SPOT locator, smart phone, GPS, sunglasses and reading glasses with their respective cases, t-paper, a “Y” tent stake for cat hole digging, and a 13″ x 17″ blue foam sit pad. This additional gear totals just over 2 lbs. Rain gear, warm clothes, hats and gloves add about another 2 lbs. 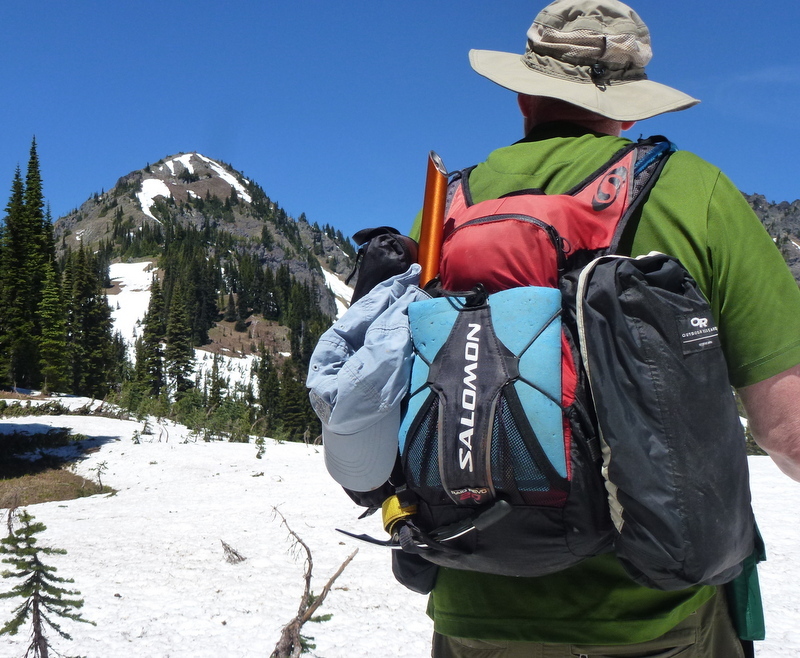 I use a light 15 L pack that takes a hydration bladder. Because 15 L is a little small, I have two add-on pockets to bring the pack weight to 1-1/2 lbs. So I have fairly complete day gear for a base weight of 7-1/2 lbs. Water and food weight increase the total for a day trip. If hard snow or ice is expected, a 12 oz., 50″ cm. ice ax and a set of micro spikes will come along for another 1.8 lbs. This is really all the same gear I take for backpacking (except maybe the ice ax). For multi-day trips, kitchen equipment, tent and sleeping items are included as well as maybe some more clothes and food storage equipment. My larger pack replaces the 15 L model. Similarly, for multi-day climbs, my non-technical backpacking gear might be supplemented with the ice ax, a helmet and a lightweight mountaineering harness. For winter snow shoe or nordic ski outings, again the same basic collection comes along with the addition of a 1 lb. synthetic fill jacket and a lightweight thermos or small pot and stove combination. The winter gear is often bulkier, so that a larger, heavier ski mountaineering pack substitutes for the smaller 15 L day pack. 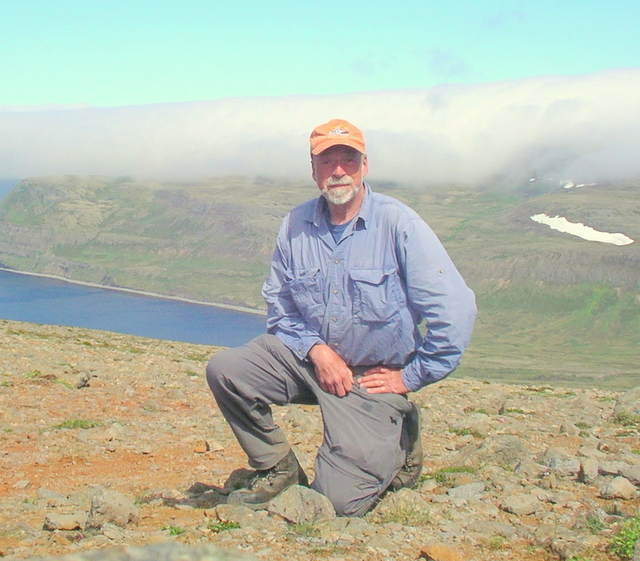 This entry was posted in Going lighter, Ultralight Philosophy and tagged GPS, sil-nylon, smart phone, SPOT, The Ten Essentials. Bookmark the permalink.